When you’re preparing for sports training, your goal should be to make the warm-up process as quick and effective as possible, period. Many dynamic warm-ups are too complex and lengthy, becoming an ineffective waste of precious training time. So how do you get the best of both worlds—thoroughly preparing your body for high performance and speeding up the warm-up process as a whole? The answer is by prioritizing “catch all” mobility movements in your routines. One of the most effective multi-regional mobility drills in the industry today is known as the World’s Greatest Stretch (WGS). And, come on, with that name you know it’s got to be devastatingly effective! The World’s Greatest Stretch incorporates three distinct positions through the flow of a single repetition. 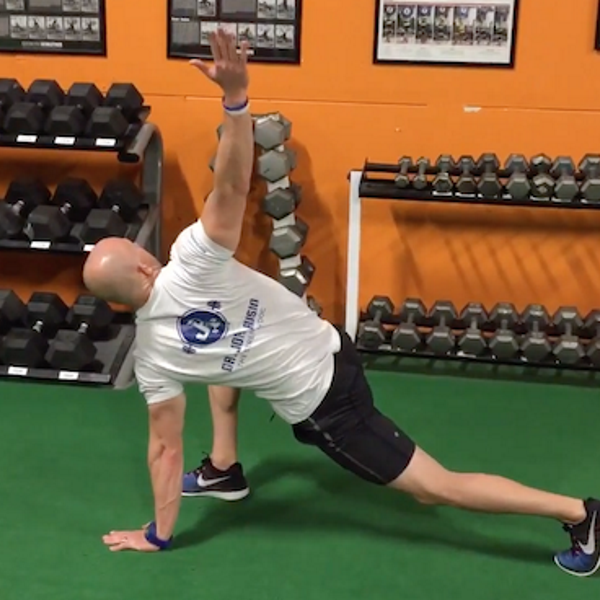 The traditional movement uses the Deep Lunge and Hamstring Stretch, but incorporate a third position targeting the thoracic spine and shoulder girdle, making it a true full-body mobility movement. This movement engages the proximal hamstring and gluteal group on the front leg and stretches the hip flexors on the back leg. When executed perfectly, it also stretches the adductor muscles on both sides. This portion of the WGS hits the hamstrings one at a time. Accentuating this position by trying to straighten the front knee while also bringing the front toes back up toward your body really improve targeting of the hamstrings along with other muscles in the posterior chain. In the final movement of my version of the WGS, the Deep Lunge is again utilized. Place both hands on the inside of the front foot. The hand closest to the front foot comes off the ground and starts to rotate up toward the thoracic spine and shoulder to enhance the position. Once the rotation is complete, come back to the deep lunge position. Remember: when performing this total-body mobility movement in a dynamic warm-up, hold each position for only a few seconds and smoothly transition from position to position. Once you make it through all three positions on one side, move forward with another Lunge and execute it on the opposite side. For most athletes, completing 5 to 10 reps on each side in alternating fashion makes for a great addition to their warm-up sequence. Can Eating Too Much Lower Growth?